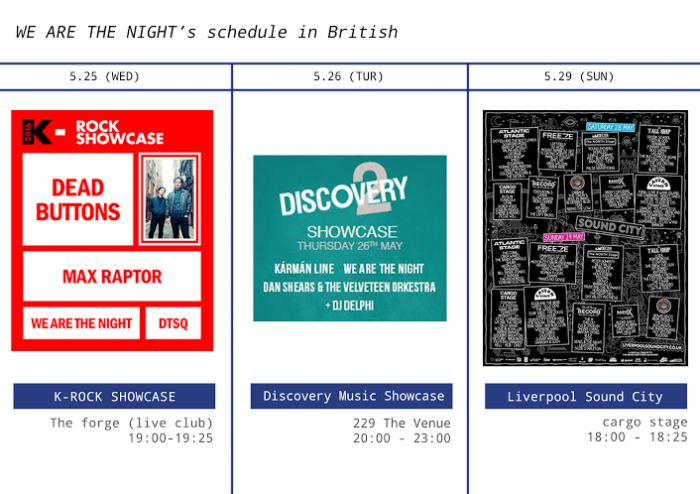 This week, various K-indie bands, including Dead Buttons, PATiENTS, Laybricks, 57, DTSQ and many more will be performing in the UK including Liverpool Sound City 2016 and some venues in London. 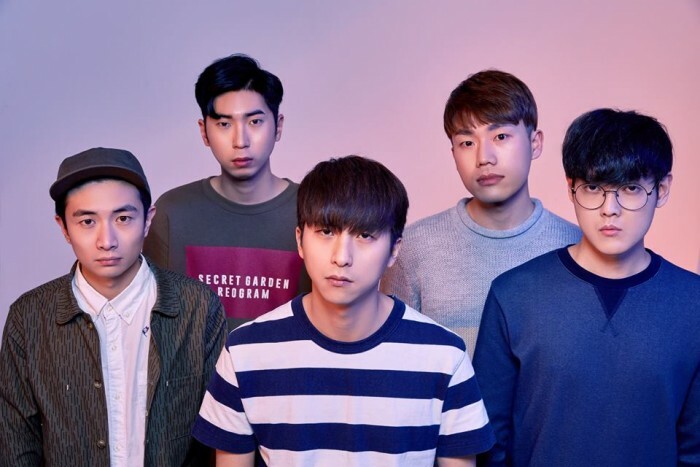 During this wonderful summer week, you are in for a treat as you will be listening to the techno-rock and synth pop music from Seoul-based band, We Are The Night (위아더나잇). Five of them met each other in high school in 2001 and formed themselves as We Are The Night before they debut in 2013. They express their ‘night’ sentiment and image emotionally through their melodies and lyrics. 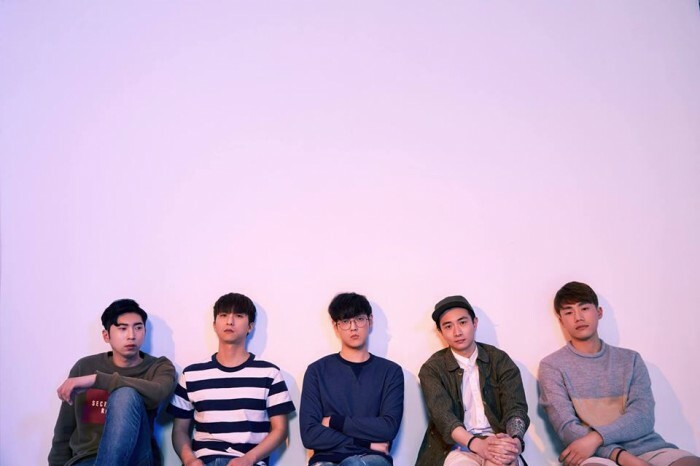 With their first single album Tiramisu Cake released in April 2013, they are known as a multi-producer band, from producing music to making music videos on their own. Guitarist Wonjoong Chong and vocal Byungsun Ham are in charge of making music videos while bass guitarist Seongsu Hwang record and mix the songs for the single album. In 15 October 2015, they released an EP album Star, Fire, Night and Such Things which shown a more emotional genre that they have been producing the album for three years. Later, Boram Kim joined as a drummer. For the past few years, they had performed in well-known local music festivals like SoundHolic Festival EXIT, Grand Mint Festival, Beautiful Mint Festival, Incheon Pentaport Rock Festival, and Greenplugged Seoul Festival. Recently, Dial is released before their first UK tour in London and Liverpool. Listening to their music is calm and delightful at the same time. Also, listening to them makes you feel the wonders of nature and travels like what We Are The Night had experienced before. As for the music videos, from Tiramisu Cake to Dial, the overall concepts are visually and artistically captivating with the use of locations and lighting that fit well with the songs. Tiramisu Cake is my favourite song because of its addictive tune and an interesting take on how we use SNS as a form of expression. The day before the start of their UK tour, the band talked about their music and their excitement to perform in the UK. We know that your music is electro-rock, how you describe your music as? We make music using synthesizer. We sometimes play music with acoustic guitar, and also play strong rock music. It makes sense that our music has a wide range of synth pop. I checked out some of your MVs and I particularly like Holiday, Star, Fire, Night and & Tiramisu Cake. I wonder how these songs and MVs came about. What inspirations made you produce these three songs? We made song Holiday as imaginations about the images of lovers who go on holiday, such as hot sun, sea, sunset. We created song Star, Fire, Night that is based on how I felt when as we traveled Jeju island, a beautiful island in Korea. I also felt about the night sea in Jeju island. So, our film crew ‘2 Diot Photos’ and us decided to make a music video with visual arts related to our feelings with Jeju Island. Lastly, we worked Tiramisu Cake by making constant refrain lyrics ‘tiramisu cake’ first and then fleshing this song out. We thought and made funny music when we see people eat cakes. The music video is produced by Wonjoong and the idea using SNS came from Byungsun. How you guys work together in producing your singles, albums and music videos? What sort of difficulties that you faced when making them? Were there times that you want to chill when youfeel stressed out? We release single albums every month. We mostly make songs during the winter. Then, we select and release one of them. However, there are some variables when we release it. We record the songs and film the music videos on a monthly basis after selecting the songs. After working tirelessly at the last half of work, we play gigs continuously for 7 to 8 months. What you do during your free time when you are away from the studio and stage? We play soccer with members and friends once a week. We feel refresh after doing some exercise. Also, we drink beer and play video game. If we have enough time, we sometimes would travel. For those who are listening to your music first time, which songs would you recommend them to listen to and why? We recommend them to listen to Holiday and Star, Fire, Night because they can feel how these songs represent our night image. You guys will be having your first UK tour in London and Liverpool. How are you guys feeling about this? We are curious about what happen and a little bit nervous for our UK tour. But we feel are excited at the same time! You recently had your performance at Sofar Sounds Seoul which is an outdoor performance and much closer to the audiences. How is it different in smaller venues compare to bigger ones? How would you feel when you will be performing at venues in London and Liverpool especially in front of the UK audiences? We are more nervous in small venues because we can see the audiences’ eyes and breathing. We concentrate more on the songs and music. Meanwhile, we enjoy performing the gigs more and are encouraged by the audiences in bigger venues or festival. If have the chance to collaborate with any artists/bands in Korea and the UK, who would it be and why? Honey and Lorde. We love their music and voice! We want to collaborate with them because they are unique. Anything that you are most looking forward to whilst in London and Liverpool? We look forward to play at gigs. I wonder how people who listen to react to our music. We are eagerly looking forward to meeting new people in a strange place. Your music video, Dial, came out the day before you guys fly off to the UK. Curious to know what the music video and song is about. Dial was released on 23 May. We want to express careful and fond mind through this song. These days, we exchange news quickly and delude ourselves that we are right next to each other. But I want to think about whether each other share deeper heart than these distant and the reason why we miss uncomfortable and hard times. What places would you recommend to visit in Seoul? How about the food? We recommend Gwangjang Market’ in Jongno, Seoul. It is an old traditional market and there are lots of foods. This place has an exotic atmosphere. Any words you would like to say to the readers especially those who will watching your upcoming UK gigs? Hello, Sumgyeojingem readers! Nice to meet you and thanks for reading interview. We are going to be fine as you will enjoy the gigs with a peace of mind. You better listen to our music before the gigs if possible. Many thanks to the band and Ruby Records for allocating their busy time to participating in the interview. Follow them on Facebook, Twitter, YouTube and Instagram. Those who will be watching the live K-indie gigs in the UK. Enjoy the music and have fun with the warm atmosphere & lovely weather.